If you’re in the market for a custom built Print Portfolio Mullenberg Design’s has a custom Presentation Solution for you. We offer 2 distinct styles of Portfolio books. The Full-Case style Portfolio and the 3-Piece style Portfolio. Each of these styles is built with a screw post binding making it easy for you to update and edit your print portfolio. So… which style is best for you? Let’s review the differences between the 2 styles to help you make this important decision. 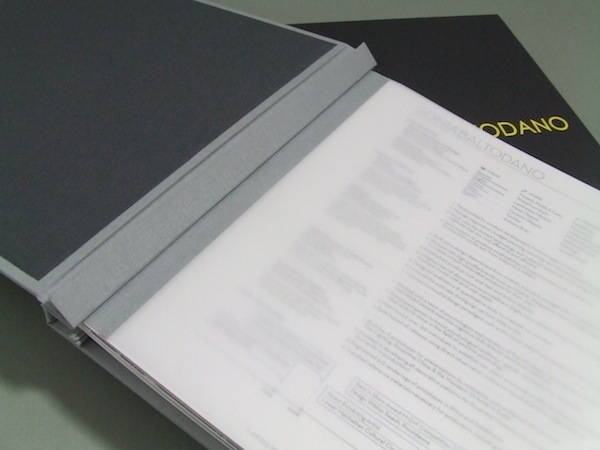 The Full Case Portfolio is also called the 1-Piece Portfolio because the front and back cover and the spine are built as one piece with an interior spine piece insert. This portfolio has the look of a traditional bound book. You can add a splash of color and personalize your Full Case Portfolio with a 2-Fabric Cover. This customization allows you to control how much of the fabric will wrap around the spine and onto the Portfolio covers. The portfolio pictured below has a 2-Fabric Cover wrap of 3 inches. You can have as little as an 1/8 of an inch of fabric wrapped onto the front and back covers for just a hint of color. Like the name suggests the 3-Piece Portfolio is built in three separate pieces. The front cover, back cover and the spine. This style works great if would like to add different color spine to your portfolio design. You can also order multiple spines and change out to the spine color for a quick portfolio update! This is also a nice option if you plan on updating your logo in the near future, as you can opt to just build out a new cover. You can add the 2-Fabric Cover customization to the 3-Piece style as well! Contact Mullenberg Designs today for your unique Presentation Solution.